At least 251 people in 37 states have become ill with one of three strains of Salmonella in connection with live chicks and ducklings sold by Cincinnati-based Mt. Healthy Hatcheries, according to the U.S. Centers for Disease Control and Prevention. That number is nearly double the 126 cases reported last month. Of the 251 people found sick, at least 32 percent have been hospitalized. 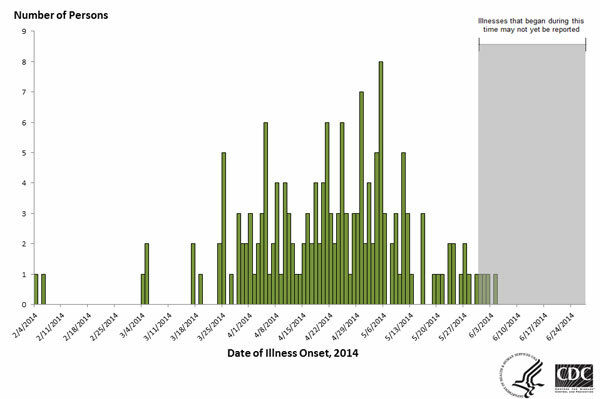 Illnesses developed between Feb. 4, 2014 ,and June 4, 2014. Any illnesses that developed after June 4 may not have been counted yet. Those ill range in age from younger than one to 95 years old. Thirty-nine percent of those ill are 10 years old or younger. Young children are especially vulnerable to pathogens regularly found on live poultry. CDC encourages anyone handling poultry to wash their hands with soap and hot water immediately afterward. Adults are advised to supervise children carefully when handling poultry to make sure they follow those recommended procedures. Below is a distribution map of illnesses by state, a timetable for illness onset dates, and a short video produced by Food Safety News on the risks associated with improperly handling live poultry.